Personalist Bioethics calls us to reflect on the intimate meaning of human existence and the social environment, going beyond any specific religious perspective and invoking human reason. It advances a metaphysics that is rationally grounded in philosophical anthropology and has a broad range of ethical applications for professors of bioethics, members of ethics committees, bioethics students, and those interested in the field in general, whether in medicine, law, or philosophy. 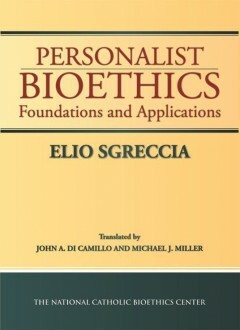 Readers will find a presentation and discussion of the basic contours of personalist bioethics, comparisons of personalism with other philosophical positions, and ethical investigations of particular topics, ranging from genetic engineering to euthanasia. Translated by John A. Di Camillo and Michael J. Miller. Elio Sgreccia, a former tenured professor of bioethics at the A. Gemelli School of Medicine and Surgery of the Catholic University of the Sacred Heart in Rome, is the former president of the Pontifical Academy for Life and current honorary president of the International Federation of Bioethics Centers and Institutes of Personalist Inspiration. He was a member of Italy’s National Bioethics Committee and is currently the director of the journal Medicina e Morale.